Bikes are, probably, the most simple and popular mode of transport of the world. However, typical methodes for ensambling bikes are really complex, almost handmade, with steel tubes welded by hand. 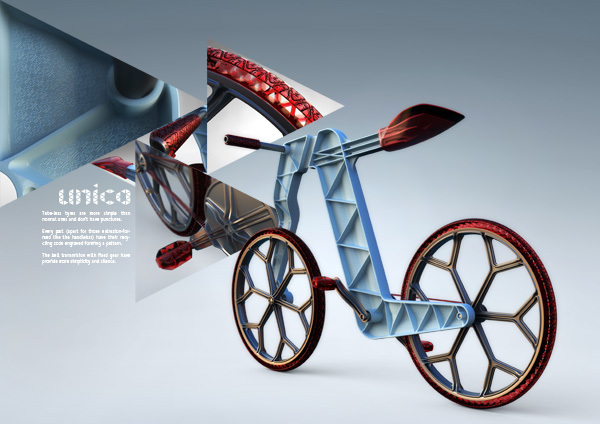 'Unico' is a bike constructed in just one piece, without any welded seams, with less parts and less assembly time. It's a simpler bike and, of course, a cheaper one. The 'Unico' frame is formed by a single piece of structural foam injection moulded polypropylene. This system provides lighter, more flexible and thougher parts than standard injection moulding. The frame is reinforced with triangular ribs, and transversal crown surfacing. That way, the frame is solid enough for a city use. At the same time, some parts of the frame don't have any reinforcement, that make it flexible enough for offering the suspension and direction. 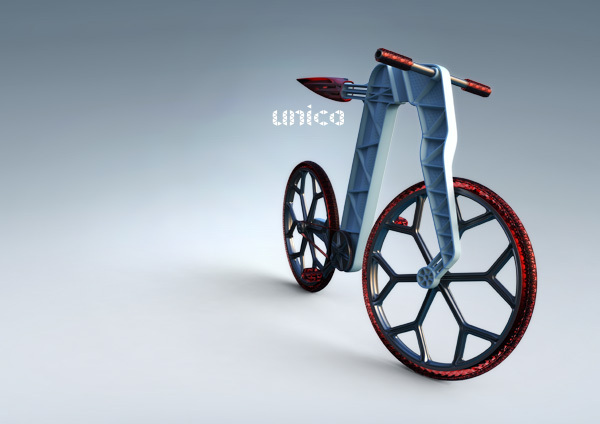 For steering the 'Unico', the thin part before the fork bends. That's not a problem because when riding a bike, we don't steer more than 20 degrees, we would fall otherwise. Every material on the 'Unico' (polypropylene for the frame and other rigid parts and polyurethane for the saddle, the tyres, the belt and the pegs) are recyclable. At the same time, injection plastic parts don't need any paint and pigments (even fluorescent ones) can be mass-injected. 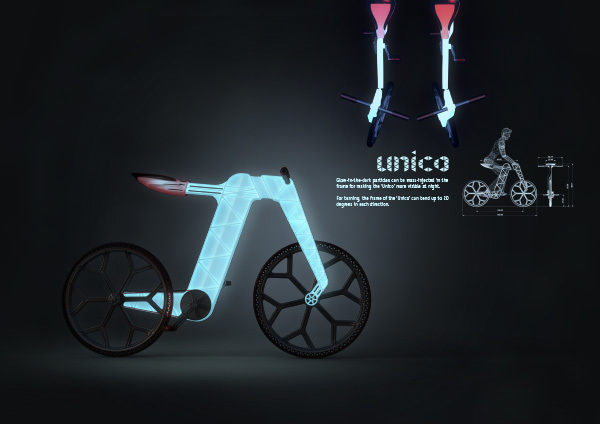 The 'Unico' has a lower environment impact than other bikes.